A clip that explains what we already know; We are apes! Tim, this is too definitive for me, I do not think we can ever say anything definitive. Life is so diverse anything and everything is possible. Darwin is still a man, and can only know so much. It's not about Darwin, it's about fossil and genetic evidence which shows without doubt we are just a branch of apes with a common ancestor. 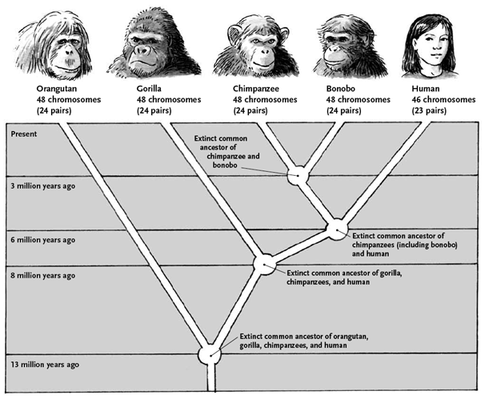 @Agartha wrote: It's not about Darwin, it's about fossil and genetic evidence which shows without doubt we are just a branch of apes with a common ancestor. Ags, I do not see total proof of anything at all, today we say yes, tomorrow we say no. Maybe we should not be so definitive because someone want to be right. Darwin is a sort of God, and that's OK, but God does not know everything, if he/she does, they are not telling us. The archaeologist might dig deeper and find out that Apes came from a species we do not know. In my view everything is tied to something and time. That does not mean it was not so, I am just not saying no to anything. I think we're more attractive though... just sayin'. I guess we are Ka but perhaps not so to other apes! With what we know about genetics Star we can trace our ancestors right back to when we split from our ancestor (and even further) and developed into what we are now. We are still changing and our descendants will look different from us. @Stargate wrote: Ags, I do not see total proof of anything at all, today we say yes, tomorrow we say no. Maybe we should not be so definitive because someone want to be right. Darwin is a sort of God, and that's OK, but God does not know everything, if he/she does, they are not telling us. The archaeologist might dig deeper and find out that Apes came from a species we do not know. In my view everything is tied to something and time. Darwin was the beginning of the evolutionary theory, we now have DNA which shows we are related to everything on the planets, including bananas (we share 50% of our DNA with bananas). Also, we have lots of viruses genomes in us which makes about 8% of our DNA.. I find it fascinating!! 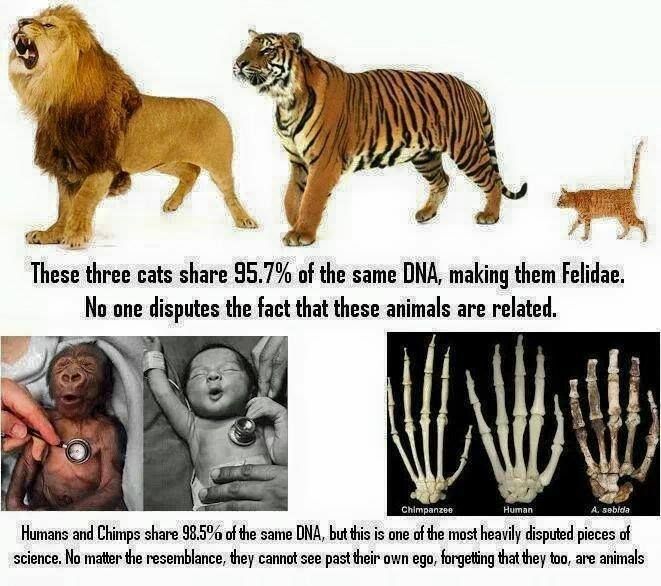 We also have enough fossils to prove who we come from and who our 'cousins' are. If we still had some of the standard ape traits such as a heavy pelt of hair all over, we would admire beauty based on how shiny and lustrous the body hair was of a fellow Human. Well my friends, I am not so sure that anything can be conclusive, however I know that all is connected. I do not believe it is that important to know the exact branch of a evolutionary branch. There has to be all the possibilities of evolutionary expansion and balance to make up the universe. I think science itself has to recognize the universal time, in order to tune it's own earthly time. What I am trying to say is after a cycle has ended the recycle begins, and the time is set back to zero. There can be no definitive data to tell us we are apes, and none to say we are not apes. If we could know the way evolution moves, we might be able to tie a direction, and able to orient our selves. Until then everything is moving. As usual, this is my version. @Stargate wrote: Well my friends, I am not so sure that anything can be conclusive, however I know that all is connected. I do not believe it is that important to know the exact branch of a evolutionary branch. There has to be all the possibilities of evolutionary expansion and balance to make up the universe. I think science itself has to recognize the universal time, in order to tune it's own earthly time. What I am trying to say is after a cycle has ended the recycle begins, and the time is set back to zero. There can be no definitive data to tell us we are apes, and none to say we are not apes. If we could know the way evolution moves, we might be able to tie a direction, and able to orient our selves. Until then everything is moving. As usual, this is my version. We can't predict how evolution is moving because it doesn't follow a path, it's random according to the environment, etc. Star, until about (aprox) 2 years ago I also couldn't believe in evolution as there was no 'missing link' between humans and apes. Then one day, discussing here with Tim, I started researching.... and I read so much until it finally click in my head: there isn't ONE missing link, there are thousands of them, they are the missing links that proves evolution. Bear in mind we are talking evolution which has nothing to do with the creation / beginning of life, they are two completely different things. Thank you my sister, I appreciate your acknowledgment that we are all connected, (however,) you knew that was coming, that does not mean there is a strait line. One part of the spectrum is time, the other part is moment. You could ask the question of how did tome get to being moment. You could also attempt to answer it by making time move faster until it reaches the speed of moment. I love your arguments. You mention DNA, mainly because it signifies the basic building spiral of our physical being, however, here it comes again, :)Lol The DNA is based on the results of evolution. It is as difficult to understand the concept of evolution as it would be to create the so called big bang. When Tim speaks about something, he convinces me he knows what he is telling me. I find we see so many things the same, however, there are instances when I do not disagree, but see the same thing a different way. Tim is a firm believer in modern science, I am only a half believer in modern science. There are three poles or stages in my knowledge base, 1.2.3, think, talk, and act. When I have completed these three, I value the results as knowledge. Modern science is good but it lacks depth, because it is not people oriented. People must understand the science in order to use it and validate it. If they do not they are apt to become slaves to the science they cannot understand. There is so much stuff here I will come back to it. Loving it. Yes, science is very mechanistic, it explains things as in how they are, how they function, and what can be expected if certain things are applied/added/etc. DNA is merely the code for the construction of these hairless ape bodies of ours, that all humans no matter what part of the planet hey come from can give blood, organs, bone marrow, and have children together should say something to all, sadly it does not. What also is less discussed is how our souls or spirits transfer, that is something science has yet to uncover. These meat-shells of ours, they could have been anything. Their purpose is as a environment interactive interface fro spirit to deal with trying to figure out concepts, pass those concepts on, and move on once we are done either learning, or passing things along to others. One may ask why we simply do not do this as spirits? Because in the realm of spirits, all is too fluid, too easy and it seems flesh beings are part of the process of our ever developing and evolving Universe. Yep Len. Science is using logical methods to come to a conclusion about a phenomenon or an idea. It has no morals of reason for being, it's just a way of finding out info. @Rockhopper wrote: Yep Len. Science is using logical methods to come to a conclusion about a phenomenon or an idea. It has no morals of reason for being, it's just a way of finding out info. I Love what you say here Tim, because it makes sense to me. If you look at it closely, it is a paradox in itself. One of the main problems as Lenny suggested, is the lack of spiritual connection to the science methods and people. Mans actual knowledge must have a component of physical proof, that comes from experience. If you study something you must connect it to something for it to be understood. Simply saying some words, that people do not understand will not validate science. It farther erodes the trust in science when the experience of an individual is not accepted as proof, especially because we are all different although we share the same type of DNA. Science cannot bring science together, it faults in the effort because it praises individuals as lords over knowing more than the last generation. Einstein is indeed a visionary, but he did not create the whole world of science, rather he brought back some discovered ancient facts, to this time in moment. If science could embrace the universe from an earth perspective first, before trying to look through an imaginary image of the universe, I think we would be much nearer to the truth. Who are lobster people again? Lol. hahaha I was just coming to ask the same!! Hi Ags, I would love for you to rejoin the discussion. @Stargate wrote: Hi Ags, I would love for you to rejoin the discussion. It is as difficult to understand the concept of evolution as it would be to create the so called big bang. But I disagree: we still don't know how this universe started. I say 'this universe' because they may well be others, as I do tend to believe in the multi-universe theory. But we are yet to find out, and such is the beauty of science...... who knows what we'll know in 5 years time? However, we do know for sure evolution is a fact: we have fossils and we have DNA to prove it. We still don't know exactly how life was created, but we can prove how it evolved from creation.